Thanks for the good discussion! About houses with partial basements: Finding a house with a partial basement does not seem that easy in the ATL, especially if you are already tied in to an area or school district. But I understand the benefit. Regarding structures like Kroger etc., which I assume are made of steel construction -- in the case of a serious threat, do you guys think it is a better bet than a SFH with walk out basement (as long as it is close enough to get to safely)? How do mid-rises stack up. Example 4 to 6 story constructions. The kind you might see in Decatur. What kind of construction do they use (any steel)? Are you saying you wouldn't live in a condo with floor to ceiling windows because you're afraid of being sucked out by a tornado? That is an absolutely bizarre thing to be afraid of. I can't find one documented case of a person ever being sucked out of a high-rise by a tornado. Even when an F5 directly hit downtown Lubbock in 1970, nobody in any of the highrises was killed. Dozens of people in single family homes were killed. And obviously in the Atlanta tornado from a few years ago nobody in any of the highrises was killed. A highrise is by far the safest building to be in during a tornado. Since this case in Lubbock is a real case: Do you know if they were mid-rises like 4-6 stories, or more than 10 stories? (If someone has lived in Lubbock they would probably know what kinds of structures exist in Lubbock). More than anything I am trying to find out if 4-6 story condos are wood construction, or steel. I agree with whoever said it is not enough of a threat -- statistically speaking -- to worry about in Metro Atlanta. But I can't say the same thing for Alabama. Saw something on the news the other day about how people over there are building storm shelters like crazy. And after the kind of weather they've had in the last year, who can blame them? Are you saying you wouldn't live in a condo with floor to ceiling windows because you're afraid of being sucked out by a tornado? That is an absolutely bizarre thing to be afraid of. Funny - I don't remember saying that. What I do remember saying, is that reporters did point out that had people been in some of the rooms that got blown out when the tornado hit, that they said had it hit later in the night, there might have been some people sucked out of the rooms along with the furniture (and yes, that could have happened if the timing had been right). Should it be a deciding factor? Probably not. I was just pointing it out. From a personal standpoint, I don't like storefront style floor-to-ceiling glass in a condo because I don't like heights, and also they're not as energy efficient as having a traditional wall with knee-wall and window in it. I lived in Lubbock and our house did not have a basement so I remember huddling in the hallway with pillows over our head. One of the reasons why I refuse to live in a house without a basement. I do not know the architectural specifics, all I know is that large buildings in Atlanta built as condos are required to have at least 8 inches of concrete between floors. I don't know how tall a building has to be to fall under that requirement, though. Most 4-6 story midrises that I have watched get built seem to be only made out of wood frame like a single family home. I'm not sure if it's a function of how tall the building is or whether it is constructed as an apartment or condo building. I do remember hearing that apartment standards were lighter, which is why a lot of buildings were constructed as apartments to get the lighter codes, but only rented for a year before converting over to condo. I really would like a basement. My realtor convinced me they are more trouble than they are worth and all they do is leak water. I mean, he did have a point, a lot of people I know with basements saw them flood in 2009, and many of the houses I looked at that had basements had kind of musty odors in them. However, for safety's sake, I often wish I did have one. Large-span buildings - e.g. big box stores - have ceilings that are prone to collapse. While safer than your car or a mobile home, they probably would not be a place to take shelter otherwise. Likewise, bridges/overpasses, garages, etc. are poor choices for shelter. As OP have noted, flying glass/debris and injury from a collapsing structure are things to be most concerned about. When when we moved here from tornado alley and there was a watch in December, I *did* miss my midwestern basement! 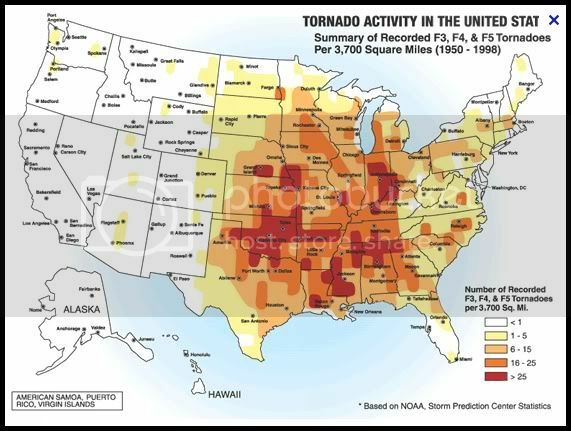 Side-note: Northwest metro and North metro Atlanta ARE in a tornado alley of their own known as the Dixie alley (or something like that). I'll add that I don't consider the threat of tornados to be great enough to factor into my selection of a home. They happen fairly infrequently here (relative to some other areas of the country), and are typically of the weaker variety, so I wouldn't let them impact my decision on what type of home to live in. While a high-rise might be safer than a wood-framed home, there are plenty of compromises to high-rise living that far outweigh the perceived added safety, IMO.